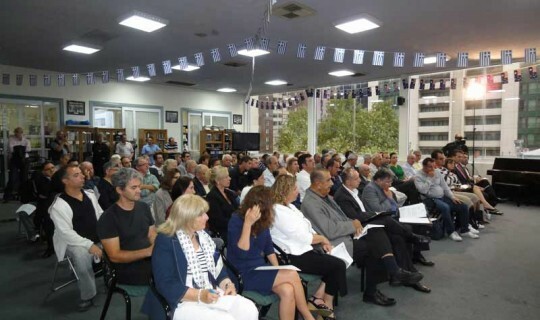 Australian Greek Welfare Society and the Greek Orthodox Community of Melbourne & Victoria held a meeting last night, Tuesday 28th February, at the Greek Community Centre to discuss matters pertaining to Greek migration. The meeting was attended by representatives of Greek Australian organisations, business representatives, individuals as well as newly arrived migrants from Greece. An office which provides information to newly arrived Greek citizens be established under the auspice of the Australian Greek Welfare Society. The office will offer assistance in regards to migration matters, accommodation, employment and welfare. Creation of an account that will provide financial assistance to recent arrivals for emergency relief. Finally it was decided that a coordinated effort amongst all Greek Australian organisations is to commence immediately in order for the implementation of a working holiday reciprocal visa agreement between Greece and Australia. The meeting decided that correspondence be sent immediately to Mr. Bowen from all participating organisations within Victoria and interstate requesting immediate action in regard to the signing of the reciprocal agreement.